Mongolia has moved to register the name of its legendary conqueror Genghis Khan as a commercial brand. The parliament in Ulan Bator is debating a law that would allow the Mongolian government to license the use of his name and image. Genghis Khan established a vast empire 700 years ago, but today his face is found on vodka bottles and the capital city has a brewery named after him. However, Mongolians are sensitive about his appropriation by foreign companies. "Foreigners are attempting to use the Genghis Khan name", one parliamentarian said, claiming that businesses in Russia, China and Kazakhstan were all portraying him as a native of their countries. 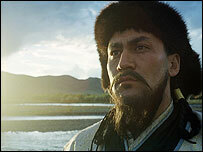 The law would allow the government to set fees for the use of Genghis Khan's name. It would also permit the Mongolian President to select one official portrait from the 10 in use and define which bodies could use this image. Under communist rule, imagery of Genghis Khan was prohibited. But as Mongolia has emerged from the shadow of the Soviet Union its people have turned to the 13th century warrior as a potent symbol of national identity. Mongolia's position, landlocked between Russia and China, means its 2.5 million strong population is concerned about any suggestion of these huge neighbours exerting control over national symbols. While Genghis Khan is better known in the West for establishing an empire that spanned half the known world, many contemporary Mongolians see him as a way of putting their country firmly on the map.